This is really pretty. Gives a bit of extra warmth and grip. Love the look of a proper costume combined with easy nappy changing. My daughter loved looking like a "big" girl in this. We already had the Happy Nappy which we love and trust, so we just added the Frou Frou for some sun protection on holiday. Something new for the girls! The Splash About Frou Frou girls costume top is pretty, fun and UV protective. The Frou Frou will dress up your Splash About Happy Nappy swim nappy and protect your child from the sun. 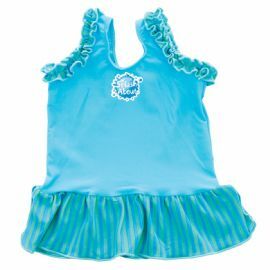 The Frou Frou girls costume top by Splash About is designed to be a good snug fit, just like a swimming costume. The Frou Frou has been designed especially for girls, to be worn with the Splash About Swim Nappy. Dress up your your Happy Nappy swim nappy with the Frou Frou costume. *Splash About Happy Nappy sold separately. The Frou Frou will dress up your Happy Nappy swim nappy. Pretty, fun and UV protective. Designed to be a good snug fit, just like a swimming costume.